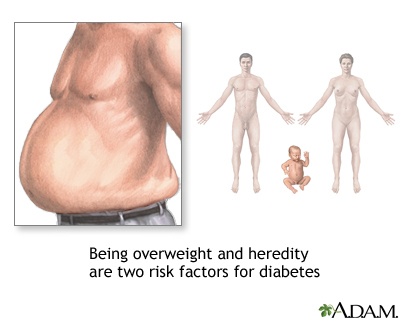 Type 1 diabetes usually begins in childhood, and type 2 diabetes typically begins in adulthood. Type 2 diabetes is becoming more common due to the growing number of older Americans and an increasing trend toward obesity and a sedentary lifestyle. Without proper management of diabetes, long-term health risks such as heart disease, stroke, and kidney failure can occur. Updated by: Ari S. Eckman, MD, Division of Endocrinology and Metabolism, Johns Hopkins School of Medicine, Baltimore, MD. Review provided by VeriMed Healthcare Network. Also reviewed by David Zieve, MD, MHA, Medical Director, A.D.A.M., Inc.